This is what I was doing for Earth Hour last night, between 8.30pm and 9.30pm on March 29 when people all over the world turned off the lights to save energy and help save the planet. While many pagans choose to do a ritual to help the environment during Earth Hour - which is a highly valid thing to do - I decided to be lazy and spend Saturday evening at home with my hubby. We played Midnight Party, which is one of my favourite boardgames. We picked that because it is a game that can easily be played by candlelight - unlike more complicated games when you need to read small text on cards or the board. 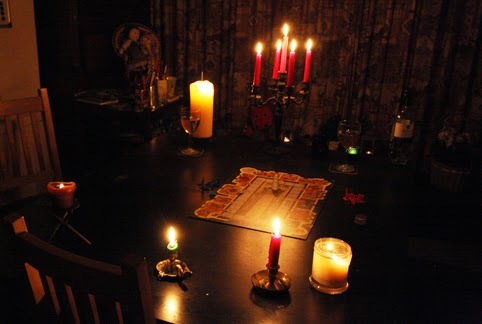 The practicalities of Earth Hour made me realise how difficult the nights must have been for those living in the centuries before electricity, when candles and oil lamps were the only form of artificial light. Apart from storytelling and singing around the fire, simple games would have been among the few entertainments available when it was too dark to read and before TV, radio, music players and the like had been invented. BTW, if you want to play Midnight Party, the original game is out of print but a new version called Tag and Hugo came out last year I learnt by checking on Amazon. Hugo is the name of the ghost in the game. I think back in the days before electric lights people went to bed when it was dark. They were exhausted from their long days of hard work and were happy to fall into bed as soon as it was too dark to do any more chores.